There has always been list chicken in the game. There have always been skew lists and counters, high Arm and high Def, Madrak2 trollblood swarms and Runes of War, and the list goes on. People have always complained about list chicken. That is not the purpose of this article. I find that for most people the issue is tied to list-building. Their plan is to cover certain Factions with one list a piece. It is often my own. I’m not sure it makes sense anymore. Today I’m going to outline my experiences with it recently, and where I think it all began. I’d like to say that with time this gets easier but the Forum has worn me down and I am now a lesser man than I once was. I am resigned to the stupidity of the advice I see given on the internet. There is little room for my energetic rage of old, only continued disappointment. Why does every anti-Cryx Merc list I see include a Mule? In the past this would have angered me but now I’m just saddened by the observation that even when they try and be competitive the Merc forums are stupid. On a more positive, and entirely unrelated note, I saw Captain America: Winter Soldier this week and it’s awesome. Take the free time you’ve gotten from no longer needing to read the Forums and go see it. It’s a better way to spend your time. Mercenaries got the fewest releases in Vengeance due in no small part to the impending release of the Cephalyx contract but even with only a handful of releases they’re definitely in contention for getting the most out of this book. Even the one arguably dud release for Mercs isn’t horrendous and easily worth the cost of also getting to be the first faction with two Colossals. With only four releases to cover, most of which have already been released, this won’t take very long so let’s just get started. Vengeance is possibly my favourite expansion for WM/H Mk2. The Cryx releases aren’t big, flashy, or obviously powerful. In that, it has much in common with every Mk2 book that isn’t Prime. But unlike the previous expansions, Vengeance is sparking notions, inklings, and temptations. As a complete book, Vengeance is one of a subtle broadening of options (and Butcher3, who has no place in any sentence including the word “subtle”. Except in parentheses), and I increasingly like how it was designed. And I think this is probably most true of the Cryx releases. I’ve been hearing increasing rumblings amongst Cryx players and the community at large about branching out away from Cryxing harder, and it’s certainly something I’ve enjoyed exploring. And Vengeance gives me more toys to continue on that path. And his model is sweet. So so sweet. I’ll admit that I wasn’t initially wowed by Goreshade3 when accurate spoilers finally hit. I’m still not wowed. I am, however, upgrading my opinion to “whelmed, but interested”. I’m starting to see more clever little interactions you can leverage to turn a Mockery of Life recursion engine up to 11, getting the most out of cunning timing and placement. That’s appealing enough to me that I’ll play him some more before making my final judgement. Also, you’ve got to respect that Feat/Siphon Bolt assassination run, and having a built in assassination on the table is always good. Power Grade: C, with the + or – to be determined. He’s not going to break into the top 5 of Cryx anytime soon, but he might be more tournament worthy than I gave him credit for initially. There was once a time when I loved the Seether. I’ll admit it. But it was a different time, a time when all we played were 35pt games, no-one I played regularly played boostable guns, and we all still played our stompy robots and angry monsters. Back then, he seemed pretty cool. But the new Seether chassis is exactly what I wanted out of a new Cryx Helljack On Two Legs. He’s one point cheaper than the Seether. He retains some focus efficiency. And he has a Shield. A Shield. A Shield. That +2 Arm makes a whole lot of difference to a helljack. He’s still not tanking anything, but removing his arms from range is no longer laughably trivial. Reach? We all know that reach is one of the marks of a heavy worth looking at, and it interacts well with things like Black Spot and Ravager. It also marks him as someone to look at for threat extending casters like Skarre2 and Mortenebra. His shield guard is also pretty useful for a lot of the casters who like the look of him already, though not, in my opinion, the reason to take him. And all for the very competitive price of 8pts. This guy keeps creeping into the conversation whenever I’m building “not Cryxing Harder” lists. While he’s not amazing, he’s a fantastically well designed model for that alone. He epitomizes what I mean when I say I really like Vengeance for Cryx – he nudges his way into your thoughts, and encourages you to break the mould a little. In a similar vein, we have the Bane Riders. I’m going to go out on a limb for a moment, and say that these guys are the best Heavy Cavalry in Warmachine (Coming second to Long Riders overall, because those guys are The Best At Cavalrying). 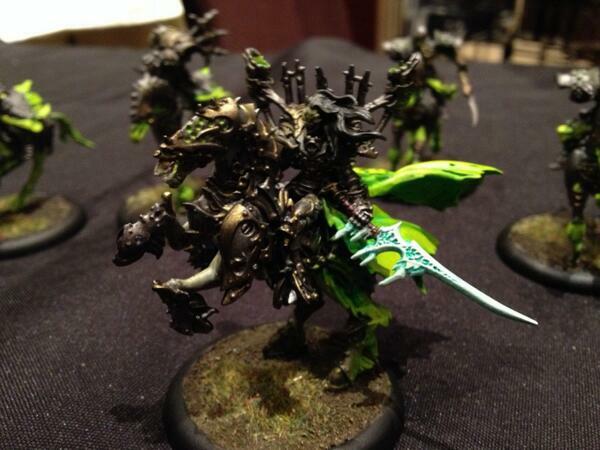 For one, Cryx can deliver them pretty well with several casters. Occultation appears on three casters, Death Ward on two others. Lich2 has clouds. On top of that, Curse of Shadows is possibly one of the best Heavy Cavalry enabling spells in the game. It’s so, so satisfying. With the right caster, you can get them where they’re going. The next problem Heavy Cavalry have is getting enough work done after they’re stuck in. But once again, Cryx have various ways to improve that situation. We have great control feats on the Deneghras. Curse of Shadows comes into play again here. They have continuous reach, so they can abuse Black Spot. Ghostly means they can get around free strikes with ease. Admittedly, their damage output seems tame compared to Bane Thralls, but that’s what Cryxian debuffs are for. And the added threat range is huge in many matchups. Warpwolves do not like eating a charge from these guys, and they can make it happen way better than footslogging banes do. And again, we come back to My Favourite Thing About Vengeance – most of the casters in the conversation are the ones who I was almost going to play, and are now in serious contention – Coven, Skarre2, Goreshade2, or ones I was playing but was looking for a new style with – Skarre1, Deneghra2. I’m afraid I must stop the positivity train of “this stuff is making me think about new lists all the time”. It’s not that the Skarlock Commander is bad, it’s just that I can’t see myself ever going out of my way to include him. If I have a point left over and I’ve already put in 3 Brutes? Sure, why not. (Well… probably Machine Wraith, let’s be honest). There’s only so much awesome you can put in a 1pt package. But I don’t hate having the option. The extra 1″ on excarnates is cool. And he can do pretty good work in combat for a 1pt guy, if it comes up later in the game. He has a magic weapon and a magic nuke after all. EVERYBODY BACK ON THE POSITIVITY TRAIN! The new juniors are all excellent. Because 3 caster independent focus is excellent. In Cryx, it is doubly excellent, because it’s one of the main reasons we completely avoid running heavies. Aiakos is triply excellent, because I love Leviathans with debuff casters, and now I have the means to do it to its full potential. And then there’s his really solid spells – +2 Spd is nice for the jack, +2 Arm is nice for him. Being able to randomly apply Grievous Wounds where needed will situationally win games, so it’s a nice bonus. Throw in some stealth and a solid defensive line of 14/17 with Stealth (while camping 1) and he’s one of the harder ones to get rid of. Aiakos is yet more excellent because even independant of his focus giving out duties, he’s a beast of a combat solo for 3pts who can and will cause all sorts of misery for solos and unwary casters. He’s Cryx’s very own Totem Hunter, if you want him to be. Aiakos is yet more excellent because he looks like the Predator and his name is badass. Aaaand yeah, he’s pretty sweet with all those casters I keep name checking this week. No, I couldn’t be happier about this guy if I tried. As I’m sure you can tell, I’m really happy about the Cryx releases in this book. The one thing I feel could have been better was Goreshade – ultimately, he doesn’t contribute to the sense of “oooh, new ways of doing things” that Vengeance has created in me, and I would have loved for him to be another caster I could break the Cryx Harder mould with. (I wanted him to have Iron Horse, Curse of Shadows, and Shadowpack. It was a beautiful dream, Harrowers and Inflictors as far as the eye could see… ) But still, that sense of new horizons for Cryx is strong in this book. I’ve been on a journey outside of the Cryx Harder box, and it has done me well. And Vengeance has only steeled me to keep walking. I am getting terrifyingly close to having done these things for a year now and I can’t help but wonder what other better activities could have taken the place of my time reading the forums. This only lasts a brief instant, though, before I remember that correcting people on the internet is humanity’s most noble purpose. These people are wrong and they need to be corrected or else how will they know their wrong? What cruel mockery of a life will they live thinking they are correct when they are not? Now, I’m not saying I deserve a Nobel Prize for my work or anything but you could at least consider nominating me. The Irish Masters has come and gone and now once again I find myself with the time to read the Forums. I guess this is a good thing but I’m not entirely convinced. Anyway, it was a busy week last week and I’ve got a lot of catching up to do. Now let’s get started since I’ve been lazy and this article has to go live in a couple of hours! Here it is folks! What you’ve all been waiting for! Yet another well poorly thought-out spewed review of Vengeance! This time we’re visiting the Protectorate to see how they made out with their new swag!